CrossOver Impersonator, a Windows emulator, promises high performance for Unix/Linux systems. With Wine 1.3.9 under the hood, it raises the question: what differentiates this Wine based program from any other? We ordered a copy to find out. On first boot, CrossOver Linux presents the ability to automatically download the list of community-supported applications. If you turn on automatic updating, this list will be checked and updated each time you launch it. Similar to PlayOn Linux or Cedega, you are shown a list of applications to choose from. Every applications running quality is measured with a medals system ranging from bronze, silver to gold. Once an application is selected, you have the first option to simply direct CrossOver to the installer file. The second more interesting option is to select a folder that will be treated like an installer disk, saving you the trouble of mounting disk images. The final step is to install the program selected. CrossOver offers a neat feature for installing applications into separate ‘bottles’. A bottle is a virtual Windows environment. Each bottle contains a unique C: drive. It also contains a complete Windows registry, a full set of most CrossOver settings, and one or more Windows applications. The program allows you to maintain multiple bottles in one CrossOver installation. This is like having several different Windows machines operating together on your computer. This is is useful anytime you want to install multiple applications yet prevent them from interacting or damaging one another. 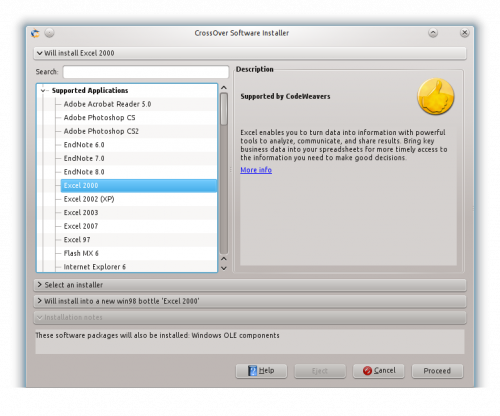 The last noteworthy feature is “CrossTie” installer. In a nutshell, this lets you install thousands of programs at the same time without any user input or configuration. To accomplish this task CrossOver contains all the configuration settings needed to create a new bottle and install the application you need into that bottle. You can download a free 30 day trial or buy the software here. The standard version will run you 39.95$ and as for the professional 59.95$. All of the above are easily installed through a Deb. package.